In honor of Eat Out For Nashville last week, a group of friends and I headed to Burger Up to support our flooded city (learn more about that in my last post) by eating really delicious burgers. 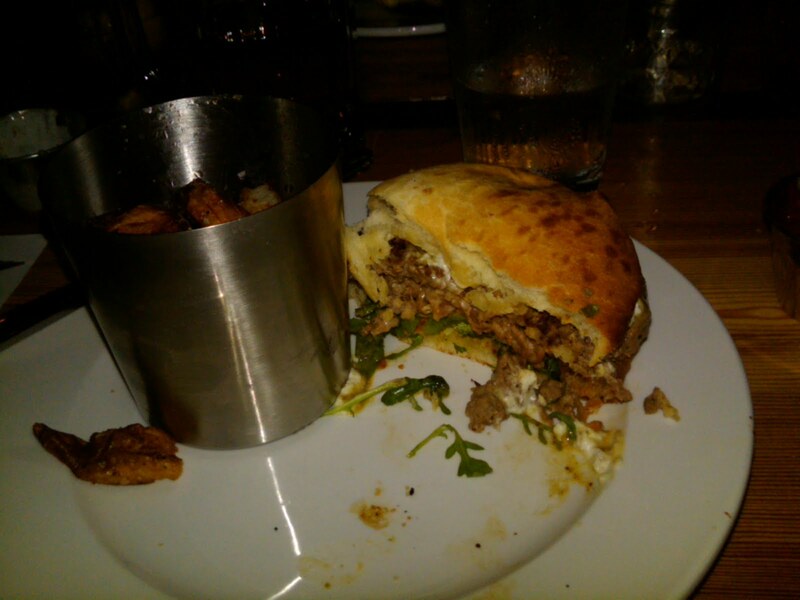 Burger Up is from the Frothy Monkey people, and it’s located in the hip little 12 South neighborhood in Nashville. Upon walking in, my first impression was good. The vibe strongly reminded me of a Chicago restaurant, not a Nashville one. Nothing against Nashville here, I just don’t typically encounter ultra-urban environments ’round these parts. I’d describe the decor as modern rustic, with exposed wood on several walls, super high ceilings, floor-to-ceiling windows and communal tables. Hipsters abounded, with their v-neck t-shirts and ironic haircuts, but there was also a good showing from the yo-pro and hippie sets. I think I fit somewhere in between all of those genres, so I felt right at home. é which is just exactly what it sounds like. 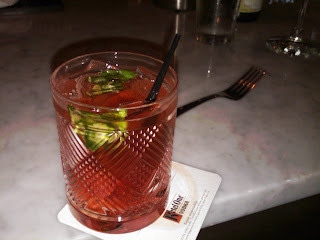 Simple syrup, strawberries, muddled basil and rosé wine. One of the reasons I love rosé so much is because it’s so dry, and the simple syrup kind of counteracted that so I probably would have left that out. Plus the strawberries were sweet enough. I also would have upped the anty on the basil, maybe muddling some in the bottom of the glass. But overall I liked the concept. And the drink sure was pretty. To start we ordered the Fried House Pickles. I am a huge fan of fried pickles, and these were some of the best I’d ever had. They were lightly breaded slices, or “coins” of pickles instead of full, deep-fried spears. I always find the breading falls off the spears, and they’re usually too hot to eat for awhile. The smaller pickle pieces alleviated these problems. The bredding was crisp and light and not soggy at all. It also didn’t compete with the pickle flavor. Definitely something I’d recommend. In total, Eat Out For Nashville raised $48,000!! Can you believe that? Burger-Up was packed and I hear almost all of the 50 or so other restaurants who signed up to participate were packed as well. In addition to making such a hearty contribution to the flood relief funds, most of the establishments had better Monday sales than they almost ever do. So it really was a win-win for everyone. In the end I highly recommend Burger Up and will definitely be back! Unless you’ve had your head in the sand, you’ve probably heard about the flood. Nashville was literally under water last weekend, and much of the water is just starting to subside now. Houses and businesses were destroyed, highways were shut down and local tourism came to a screeching halt. So, local restaurateurs are rallying to raise some money. In a movement called Eat Out For Nashville, on May 17, local restaurants from Nashville to Cool Springs will donate at least fifty percent of proceeds to the Tennessee Emergency Response Fund of the Community Foundation of Tennessee. So far participating restaurants include Amerigo West End, Amerigo Cool Springs, Baja Burrito, Burger Up, Lazzaroli’s Pasta, The Melting Pot, Menchie’s Yogurt, Paradise Park Trailer Resort, Patterson House and The Perch. And that’s pretty damn good considering this movement started exactly one week ago and has been promoted and seeded almost exclusively through social media platforms. Consider that for a moment. While many jump at the chance to bash social media as a “waste of time,” Eat Out for Nashville shows how these platforms can help mobilize an effort, communicate for a cause — and all for free. For updates and to join in the support, follow @EatOutForNash on Twitter (already 230 followers!) and “like” them on Facebook (907 fans so far!). The word is spreading like wildfire, or perhaps like rising flood waters. If you’re local, dine out next Monday and share where you ate! I haven’t yet decided where I’m headed but I’ll be sure to post it to the blog. Stay tuned. I’m on location in Portland this week. Ah…the land of beautiful landscapes, local eating, and the hipster, hippie-dippie set. Love it out here. The main purpose of my visit is to attend the annual conference of the International Association of Culinary Professionals, which kicks off today. Over the next four days I’ll be listening to the likes of Kim Severson, food editor for The New York Times, and Ruth Reichl, former executive editor of Gourmet magazine, wax on about food and cooking. I’ll also be attending sessions with topics like “The Death of Recipes” with Michael Ruhlman, “Career Strategies for Food Writers” and “Culinary Medicine: Eating Something You Believe In.” You can imagine my excitement. 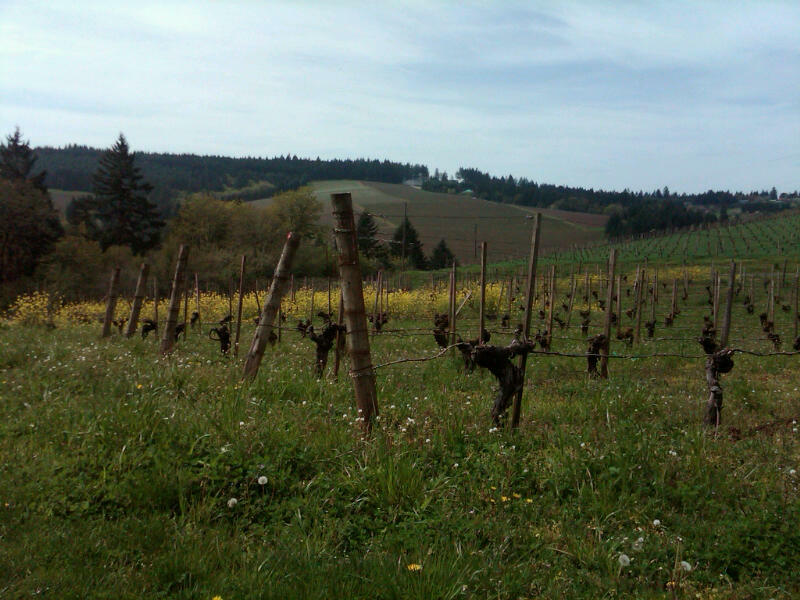 In addition to all that, I’ve also been visiting with friends and doing some of my own food and drink “research.” On Sunday my friend Ashley and I went wine tasting in Yamhill County outside of Portland. 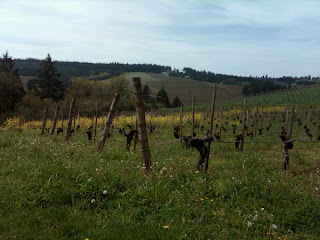 We tasted lots of famous Oregon Pinots including Pinot Blanc, Pinot Gris, and several Pinot Noirs. I love Pinot Noir, and was surprised at how different each was, based on vintage and winemaker. Some were the typical jammy wines with red cherry and plum notes. Other were peppery, with a hint of mushrooms. 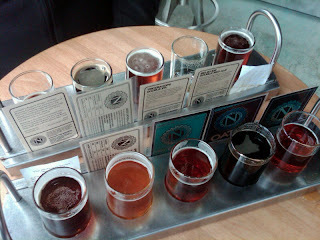 Yesterday, my buddy John and I enjoyed some late afternoon beers at the relatively new brewpub Ninkasi in Eugene, Ore. The Pacific Northwest is famous for their hoppy beers, so we did a sampler of several of them, so I could taste the differences. Until recently, I thought I wasn’t a fan of pale ales and their signature hoppiness. But as I’m learning, that’s like saying I didn’t like something as vast and varied as bread or pasta. There are a zillion different kinds of pale ales and India Pale Ales (IPAs). In fact, I’ve long-considered Bass to be one of my favorite beers, not realizing that it was a pale ale, too. Guess I needed to get my facts straight, and Ninkasi helped me do that. PK Nice was one of my favorites of the five we tried. It’s a pale ale with more corn than barley so the malt is smoother. It also had notes of vanilla, which complemented the malt well. And the hops somehow squeezed their way into all of that for a round, refreshing beer. My second favorite beer was Tricerahops…a double IPA! Can you believe that? Double the hops of a regular IPA. Somehow it was citrusy and refreshing without any of that “bite” I thought I didn’t like in hops. My mind was blown. To read more about IPAs and pale ales and their differences, including an interesting fact about how India pale ales got their name, check out this article published in Seattle Weekly a few years back. It gives a great overview of the two styles. More to come from this conference and Portland, I’m sure. Stay tuned! I think garlic is exciting. When using it minced as an aromatic in a saute, I add it at the point the onions are becoming translucent and only allow it to cook until fragrant, or about 30 seconds, before I add the next ingredient. Whenever I hear that sizzle as the small minced morsels hit the pan, I swear my heart starts beating a little faster. Garlic just elicits good feelings.. Imagine my excitement when I read a recipe in a recent issue of Bon Appetit for bagna cauda, a garlicky dip for crudites or steamed vegetables like artichokes that called for three heads — not cloves, heads — of garlic. Place unpeeled garlic cloves in small saucepan. 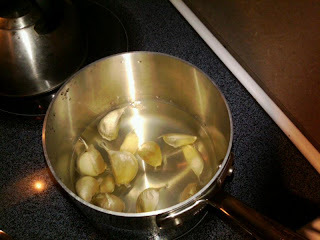 Add enough water to cover garlic cloves by 1 inch. Bring to boil; reduce heat to medium-low, cover, and simmer until garlic is tender, about 25 minutes. Drain; transfer to plate. 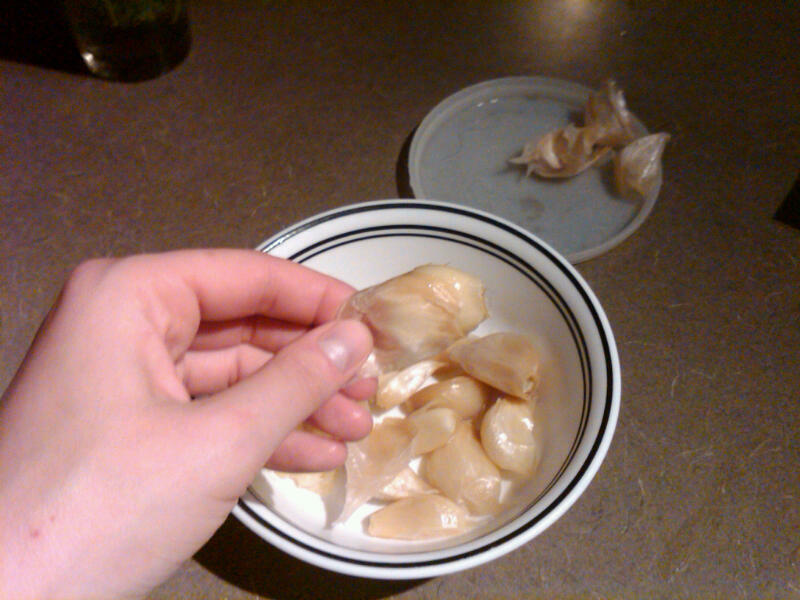 Chill garlic cloves until cool enough to handle, about 10 minutes. 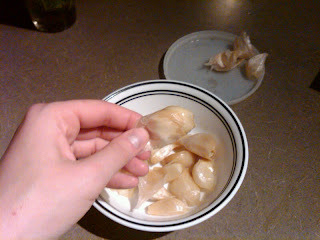 Squeeze garlic cloves from peel and place cloves in small bowl. 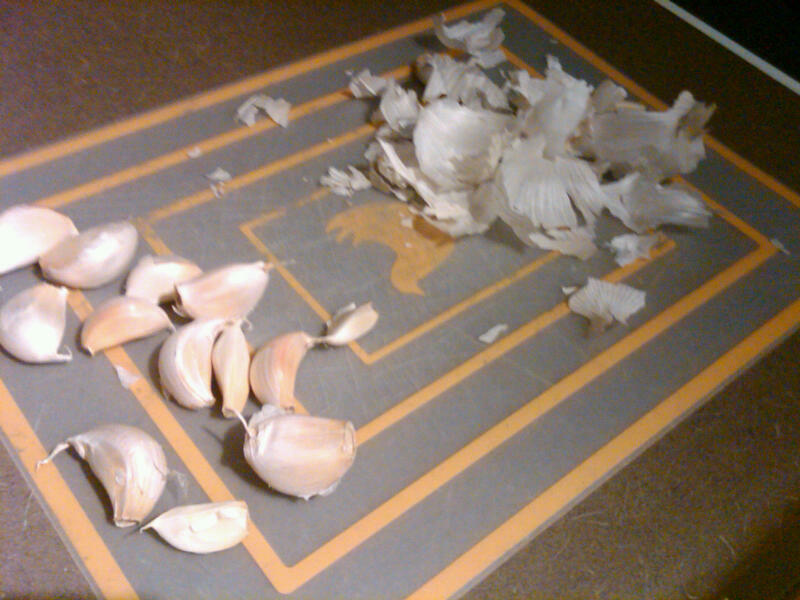 Using fork, mash garlic cloves until smooth. Melt butter in heavy small saucepan over medium heat. Add anchovies and sauté 1 minute. Add mashed garlic and oil. Simmer over low heat 10 minutes to allow flavors to blend, stirring occasionally. Season to taste with salt and pepper. DO AHEAD Can be made 1 hour ahead. Let stand at room temperature. 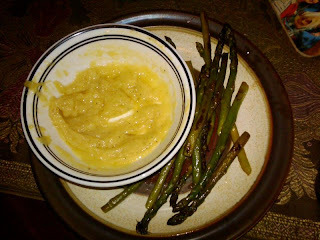 Rewarm before serving, stirring occasionally (bagna cauda will separate when served). New job, new house, new city. And now I’m back, Nashville. After many life changes, it’s time to start blogging again. But first, an update. This is a little more personal than my posts usually are, but here goes anyway. I just started a job as the private events coordinator/PR maven at The Viking Store, a cooking school and retail store for kitchen goods in the pretty little town of Franklin, Tenn., right outside of Nashville. So far it’s going amazingly well. My goal when leaving Chicago and the world of public relations agencies was to find a job where I still got to use the skills I learned at the agencies (communication, management, organization), but closer to the kitchen. Now I’m planning foodie events, working with chefs to choose menus and generally getting people excited about cooking classes. It’s a pretty good match for me. If you have any friends or business connections who may want to plan a foodie event for their group, I’m your girl. I know, I know, this blog is not for promotions, but I had to give myself a little plug. I’m a networker, after all! Secondly, I moved. And it’s awesome. The house is old and has tons of character. 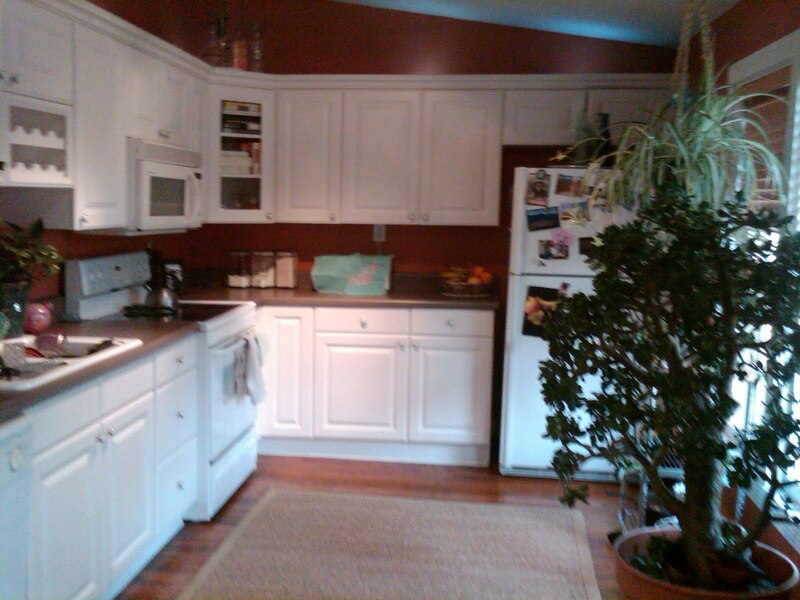 The kitchen is BIG, well not that big, but it’s the first kitchen I have had mostly to myself and my cooking equipment so it feels enormous. I’ve put my tools in a tool drawer, pan lids in a pan lids drawer and have all my cookbooks out and ready for use (in that glass corner cupboard in the picture below). And I love it more than even I could ever imagine. I feel like I’m a better cook these days because of it. Speaking of tools, I’m looking to outfit my kitchen with some new goods now that I’m surrounded by cooking gadgets of all kind every day at Viking. My current favorite is a microplane. It zests like the devil, and also acts like a strainer when you squeeze a lemon or lime over it if you don’t have a nifty citrus juicer, which I don’t (I smell a first purchase). Lemon zest adds such a kick — the zest takes the lemony flavor to places the juice alone never could. The only way you can get this zippy zest is to use a microplane or zester. So go buy one! Seriously they cost a few dollars and it’ll add so much flavor to baked goods, sauces, dressings — anything — very easily. I was poking around online to find something on zesters to prove my point, and I found this excellent Chow.com video tip. I could watch their online tips for hours. They’re short, succinct and helpful. I’d even venture to say it could make the viewer a better cook. Check them out — it’s only 28 seconds long and definitely worth the time. PS (can I include a PS in a blog? I guess I make the rules for this blog so YES): I appreciate all the “follows,” comments and encouragement over the years. Thank you so much for taking the time to be interested. It’s my April resolution to update more often with a variety of posts, so stay tuned! Your support makes me tear up just thinking about it. Seriously. Well, I cooked the squash. My roommate said it looked like a vegetable massacre in the kitchen, after I was done slicing, peeling, seeding, roasting, smashing and pureeing. To be honest, I had some reservations about the results of all this squash. Having so many different varieties to deal with (see last post for the particulars) made me realize that squash and other gourds can be intimidating. They have this hard, seemingly impenetrable exterior, with vibrant, sometimes wild streaks and blotches. From the outside, there is no indication of the flavor and texture of what lies within. And when you slice them open, the fibrous, fleshy pulp doesn’t immediately smell or look appetizing. It takes long, slow cooking to coax out the buttery, earthy flavors. But I learned you just have to jump in, roast the suckers, and hope for the best. It was quite a day and I was exhausted at the end. But I did conquer my fear of the squash unknown. Following is an overview of the results of a pie, soup, roasted seeds and mashed squash. But first, I cooked all the squash the same way. They were sliced, seeded, and roasted with a little butter until they were tender, and the skins had begun to collapse. Once cool, I scooped out the flesh and composted the skins. All the recipes begin from this point. I forgot to take a picture of this baby, but it was good. It’s really gratifying to make a pie completely from scratch — homemade crust, homemade pumpkin, homemade whipped cream. The best part was the topping. The nuts gave it a savory note to combat the sweet brown sugar. At least just try the topping sometime. Yum. I substituted one cup of fresh cooked pumpkin (from the cushaw and pie pumpkin) for the one cup of canned it calls for. For the record, there is nothing wrong with using canned pumpkin. I’ve read it’s one of the best products you can buy canned, because it’s just cooked pumpkin, without any of the hassle. But if you want to use fresh, just make sure you puree the cooked flesh (for a smoother-textured pie) and use cheese cloth or a couple of paper towels to squeeze out the excess water (so the pie doesn’t get soggy). Even though I used cushaw squash and a pie pumpkin, the flavor was still earthy and pumpkin-y — just like mom used to make. This was a made-up recipe, that turned out pretty well, if I do say so myself. I sauteed a chopped medium onion in olive oil until the onion was translucent, then added in a few cloves of minced garlic, just until the garlic was fragrant. Then I added about 3 cups of cooked squash, 4 cups of chicken broth, 3 tablespoons of ground ginger, 1.5 tablespoons ground cumin, and one tablespoon of cayenne. Then I scooped portions into a blender, added a dash of milk, and pureed it until fairly smooth, but still with texture. Then I added it back to the pot, added salt and pepper to taste, and let it barely simmer for an hour to meld the flavors. I ended up freezing about a third of it in individual plastic baggies and have been enjoying it in single-servings for lunch. Yum. I mixed all the seeds from the various squash together for the roasted seeds. After doing some research, I learned that the key to good seeds is getting the seeds dry enough to ensure they brown. There are several ways to accomplish this. Some people rinse them to get the slime off, then leave them out to dry overnight. Others boiled the seeds in salted water for 10 minutes to season and clean them, then dried and roasted them. Still others just rinsed and dried and roasted them. I tried the latter of the two techniques (I have no patience for overnight drying! ), first tossing the cleaned seeds with a tablespoon of unsalted butter and some table salt. The seeds that were boiled in salted water first had a better flavor than those that were just roasted. I had a little squash left over from the cushaw and the acorn squash, so I mashed it up with a little milk, salt and pepper and sprinkled it with some gorgonzola and fresh parsley. It was good, the flavors worked, but it needed some fat or heavier cream instead of the milk. If I make it again, I’ll add in a little butter during the mashing. We got six inches of snow in Nashville this weekend, and people are losing their minds. Having recently moved from Chicago, I find this freak-out particularly humorous. Schools and businesses everywhere have shut down, grocery stores are short on milk, eggs and canned goods, and cars have been abandoned all over the highways…seriously abandoned, often unscathed. People must see ice, panic, slam on the breaks, fling open the car door and run screaming down the highway, hands waving in the air. Or at least that’s what this snobby, snow-hardened northerner imagines. So I’m staying in, away from all the madness. To occupy myself during the freeze I’ve decided to do some cooking. What better way to pass the winter hours than to fill the house with warm smells and good food. Plus it’s a great feeling of accomplishment and productivity without ever having to leave the house. But what to cook? For a foodie, this is a great problem to have. I pulled out my favorite new cookbooks (Christmas gifts…thanks Mom!) including Chez Pannise Vegetables, The Gourmet Cookbook and CookWise by Shirley Corriher and began flipping through. As I was getting situated at the kitchen table, I had to move a few things around to make room for the books — a newspaper, a couple magazines, and a huge bowl of squash my friend and frequent La Aguacate commenter DJ B gave me from his CSA share. Oh wait. These squash are real beauties. I learned from Angel at Avalon Acres, the farm where they were grown, that they are (from left): cushaw, a really cool squash indigenous to middle Tennessee, pie pumpkin, the tan one is a Cuban pumpkin, and the two small ones are acorn squash. And so begins my squash-buckling adventure. I’m thinking definitely a pie, maybe soup, something roasted, a mashed variety with blue cheese, something in bread form and maybe more soup? What have you made with squash? Do you know these squash? What’s your favorite type of squash? How many times can I say “squash in the same paragraph? Squash, squash, squash. I’ll circle back soon with the results of my day/s of squash cooking. Stay tuned. At nearly five pounds, with a tough-looking texture and dark, stormy coloring, the rutabaga appears a formidable adversary. Its name even sounds intimidating. But supposedly, according to a recent article in The New York Times, “it’s the best vegetable you’ve never tried.” I was intrigued. According to Susan Tyler Herbst in Food Lover’s Companion, “this root vegetable is thought to be a cross between a cabbage and a turnip.” She also shares that “the name comes from the Swedish rotabagge, which is why [it’s] also called a Swede or Swedish turnip.” Rutabagas are in season throughout the cooler months, as most root vegetables are, from September to June. I was right on time. I got to work cutting the beast down the middle, peeling it and slicing it into a half-inch dice. It really didn’t take long, but the initial cut through its nearly five-inch diameter took some strength. I decided to prepare my rutabaga in two different ways, both mentioned in the article above. I tossed one half in a pan of salted boiling water and cooked it f or 20 minutes. When it was tender, I drained and mashed it, and added a tablespoon of unsalted butter and a dash of salt and freshly ground pepper. I left the peel on the other half and tossed the cubes in some olive oil, REAL maple syrup, salt and pepper. Then I roasted them for about 30 minutes, until the flesh was just tender, but not too soft. The flavor was peppery like a turnip yet buttery like a squash. It had a fresh, clean taste, and wasn’t too starchy. The boiled rutabaga wasn’t silky smooth like mashed potatoes can be, but grainy and a little fibrous like squash. It was fine just the way it was but would also have tasted good with some fresh parsley sprinkled on top. The roasted version was also tasty. The maple syrup added the sweet flavors of fall. I also would have enjoyed it as part of a roasted root vegetable medley including sweet potatoes and onions with a little thyme. Overall my rutabaga experience was a good one. I enjoyed it with Chicken Breasts Provencal, polenta and fresh spinach. If you can get past the rutabaga’s intimidating exterior, you’ll find the delectable flavors coaxed out of this rooty beast make it worth your while to try it. I love mysteries. I like watching the clues unfold onscreen in classics like “Murder She Wrote” or in modern day dramas like “Law & Order.” I also love reading mystery novels. 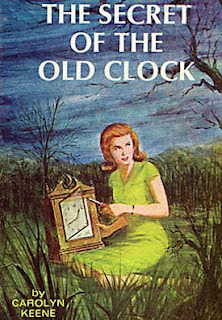 One of the first book series I ever got into was Nancy DrewMystery Stories.Those dreamy 1940s-era detective stories with the young strawberry-blond sleuth in her sweet pastel pantsuit outfits, attending dinner dances with the handsome Ned Nickerson, while simultaneously duping the bad guy always kept me interested. Even in spite of the fact the reading level was for that of a third-grader. To this day, whenever I go home to my parents’ place and their collection of old-school Nancy Drew novels, I love to flip through titles like The Mystery at Lilac Inn or The Hidden Staircase for a quick, easy read. Sometimes you just need something simple and entertaining. I experienced my own mystery of sorts the other day in the kitchen, in a tale I like to refer to as The Mystery of the Hardboiled Egg. The mystery began on Christmas morning. I’d received several cooking reference guides, and I’d curled up to read one in front of the tree. CookWise, by Shirley Corriher, unravels the mysteries of cooking and baking with scientific explanations and straightforward recipes to explain the points detailed in its well-written chapters. There is an entire chapter devoted to eggs, and an entire section dedicated to hardboiled eggs, though Shirley refers to them as “hardcooked” since the eggs aren’t actually boiled, but cooked in really hot water. Shirley says eggs gently cooked this way are more tender and moist than eggs that are boiled. She gives all the science behind this phenomenon, and I became intrigued with this first clue. So I got to wondering about hardboiled/cooked eggs. In recent web wanderings, I stumbled upon another expert who had a “best recipe” for boiled eggs: none other than Ms. Martha Stewart herself. I grew up eating hardboiled eggs that were boiled for 10 to 15 minutes then chilled and liked them just fine. Could there be a better way? I decided to find out. And so, The Mystery of the Hardboiled Egg began. For tender, moist hardcooked eggs, Shirley suggests two different methods: a cold- and boiling-water start. I chose the cold-water start as it’s a speedier option, and let’s face it — would I actually go to a lot of trouble to hardboil eggs when I’ve been enjoying them cooked by a very simple method for my entire life? I don’t think so. *Shirley suggests cooling the eggs under cold running water for five minutes. But since we’re in the middle of an environmental crisis and all, I decided to conserve. This is the Annakate version. As you may be able to tell from the pictures (they didn’t look as dark onscreen), the Martha Stewart eggs were my favorites. The whites were a little softer than the ones cooked my way. My favorite part about these eggs was the soft, smooth yellow yolk. It wasn’t dry or crumbly at all, and really melted in your mouth. The whites of the Shirley eggs were also more tender than my version, but the yolks were a little drier than the Martha version. The eggs I boiled for 12 minutes were fine enough, just as I remembered them. The whites may have been a little more rubbery than the other two, but not significantly. The yolks also weren’t quite cooked all the way. In the end, The Mystery of the Hardboiled Egg taught me that there actually is more than one way to skin a cat, er boil an egg. I really did like the smooth, velvety Martha Stewart eggs better even if it wasn’t a significant different. In my culinary adventures I’ve learned that if you can make something a little better with minimal effort, why not? The process for the Martha eggs wasn’t much different than what I knew from childhood: As noted above, just place the eggs in a pan, cover with cold water, bring to a boil, then cover and remove from heat and let sit for 11 minutes. Not too bad. I’ll make my hardboiled eggs like this from now on. I don’t think Nancy Drew could have done better herself at solving this mystery. Case closed. There are a million kinds of recipes in this world: the one for a famously good dessert; ethnic ones with exotic ingredients; or simple ones you find online for a fast weeknight dinner. Then there are recipes that matter. They matter because they’re old and cherished. They matter because there’s a long and involved process that makes them special. Or maybe they matter because they’re part of a family tradition. Each type has its own place and purpose. One such example is the layer cake, a Southern holiday tradition that’s been going on for many generations. 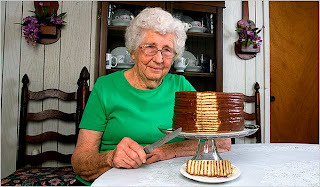 The New York Times just profiled several ladies in southeast Alabama who have been making these delicate cakes, sometimes having upwards of 15 thin layers, since the 1930s. These recipes matt er for all of the reasons above: they’re old, they’re quite a process and an art — one that risks getting lost in today’s time-crunched society — and because they’re a family tradition. It’s a fascinating article, one that I really enjoyed reading. Maybe one day you’ll see layer cakes showcased in this blog. But today it’s all about noodles — my great-grandmother Pauline’s noodles. These noodles have been at most all our family reunions and holiday gatherings since I can remember. They are wonderfully thick egg noodles cooked in a rick chicken stock, and they are to die for. The king of comfort foods, the soup of all soups. These noodles are truly the stuff of my dreams. They taste like home to me, like family. I’ve just moved to Nashville, and in the process of moving, I’ve been thinking a lot about life, my interests in food, and my family. So naturally, over Thanksgiving, when someone mentioned the noodles, I decided it’s time I learned to make them so that I can continue the tradition with my generation. A few weeks ago, my wonderful great uncle and aunt, Jim and Jean Williams, had me over to make noodles. I sort of invited myself over, and they were kind eno ugh to have me. When I walked in on that cold Monday morning, Jimmy had all the ingredients displayed on a beautiful antique marble counter top, like the set of a television cooking show. A funny sight, I thought, considering my best memories of Uncle Jim are of him in his gas man shirt, his dress code for decades when he worked for the gas company in Columbus, Ohio. He has more of those embroidered work shirts than he knows what to do with, so he still wears them when he’s working around the house. He’ll pop up out of my Dad’s basement workshop wearing his standard uniform, complete with the embroidered “Jim” over his heart, over to borrow a tool of some sort, or he’ll trot out of his barn, where he and Jean pour candles for their craft show business, with wax in his hair and a smile on his face. He’s got a big voice and a strong laugh and he’s the orneriest son of a gun you’ve ever met. His standard greeting to me is him bellowing “Annakate Tefft!,” always first and last name, followed by a big bear hug. You can imagine my grin when I walked in to his house to find him all set up in the kitchen like Martha Stewart, ready to teach me to make noodles. He and Jean giggled and laughed and picked on each other lovingly the whole time. I was in heaven. My great-grandmother Pauline Williams was Jimmy’s mother, and a helluva lady. She died when she was 99, in 1999, coincidentally enough. I often imagine the party we’d have had had she lived to be 100. She lived in a quaint red house on a hill in New Lexington, Ohio — a perfect little home for a sweet little great-grandmother, I always thought. Her trademark gift, to all of her many grand- and great-grand kids, was a crisp dollar bill every time she saw us. At family gatherings, I always remember lining up with my brothers and cousins to get our dollar, receiving it with a hug and a “Hello little girl/boy,” from Pauline. I think I saved one of her dollars in my belongings somewhere, to remind me of her. Anyway, Pauline was one of seven girls from the Brown family. While I attribute this recipe to her, this recipe is actually a “Brown sisters'” recipe, one that they all made probably quite often to feed such a large family. The recipe is cheap and simple, and so wonderfully tasty. The noodles are technically egg noodles and only contain eggs, flour and salt, then some broth or stock to cook them in. Jimmy taught me to add a little yellow food coloring, “because people like their noodles nice and yellow,” he told me, but I decided to try making them without it, just to see how they turned out. As you can see, they turned a nice golden color, all on their own. Following is the step by step process. If you try them, please let me know how it goes! You’ll need: 12 to 13 eggs, 8 cups of all-purpose flour, a pinch of salt, and broth/stock to boil the noodles in. The amount of broth depends on how you like your broth-to-noodle ratio. I like more broth than noodles, so I use a lot. The soup is fine with just those ingredients (and super cheap, too! ), but you can also add in some root vegetables (cook them before you throw in the noodles so the noodles don’t overcook), cooked chicken, herbs or other seasonings. Yield: 16 people, give or take; enough to fill 2 gallon size bags with noodles. If you’re not using all the noodles at once, freeze the uncooked ones in the bag. For a quick weeknight dinner, drop a handful of those frozen noodles into simmering stock and cook until done. In a mixing bowl, combine 12 eggs with 2 cups flour and a healthy pinch of salt, and mix with a fork (use 13 if eggs are small). Once eggs and flour are sufficiently combined, add 2 more cups of flour until sticky dough forms. Continue adding 1/2 cup flour at a time, kneading/mixing dough with your hands, until 6 cups have been added and dough is soft and pliable and doesn’t stick much to the side of the bowl. Form dough into 10 to 12 small disks, about the amount you’d use to roll out a pie crust, and set aside. On a heavily floured surface, roll out the first disk, flipping the dough over a few times after the first few passes with the rolling pin and sprinkling more flour on the work surface and dough each time (you’ll use the other 2 cups of flour in this way as you roll out the remaining disks). Roll the dough to about the thickness you would for pie crust. Slice the dough into four quadrants, and stack on top of each other. It’s necessary to use so much flour as you’re rolling the dough out so the layers don’t stick to each other once stacked. Roll the four slices into a log. With a sharp knife, carefully slice the log crossways into ribbons. Carefully sprinkle the ribbons onto a plate, untangling them from the roll, so the noodles are mostly separated. Then fluff them up with a fork/fingers so they’re gently mounded on top of each other. Don’t worry about seperating them all perfectly — they’ll natrually seperate as they dry, and even further once they start cooking in the broth. At this point, the noodles are almost ready, but need to be dried out before they’re cooked. This can be done by punching in 1,2,3 to the microwave (1:23, a humorous modernization, I thought! ), or, you can also dry them out by baking them in 2 batches for about 6 minutes at 350 degrees on a baking sheet. After the noodles are dried, spread them out to cool. The noodles should look “rustic” (my favorite way to describe imperfect food). They don’t have to be perfectly formed, just as close to the same size as possible, so they cook evenly. Step 7: Bring a pot of stock or broth to a boil, and cook the noodles about 10 minutes, or until done. Enjoy with crusty bread on a cold day.